Avocado trees grow throughout California as a commercial crop and as a landscape specimen. Hardier varieties grow well in Northern California and more cold-sensitive cultivars flourish in the southern and central regions of the state. In areas of high wind, protection is required because the tree can easily sustain damage. The avocado tree grows to a height of up to 80 feet and produces an abundance of evergreen foliage. Grafted avocado varieties readily produce fruit within two years, but seedlings will often not produce fruit until they reach 20 years old. Plant avocado trees in California from March to June. Dig a hole in a well-draining soil site. The avocado enjoys a soil pH of 6 to 6.5. Dig a hole that is twice as large as the avocado tree's root system. Tamp the soil down when planting to remove all air pockets between the soil and the root system. Apply at least 2 to 3 inches of bark chips for mulch around the avocado tree. Use large diameter mulch. Redwood bark mulch is ideal. Keep the mulch at least 5 to 6 inches away from the trunk of the tree. 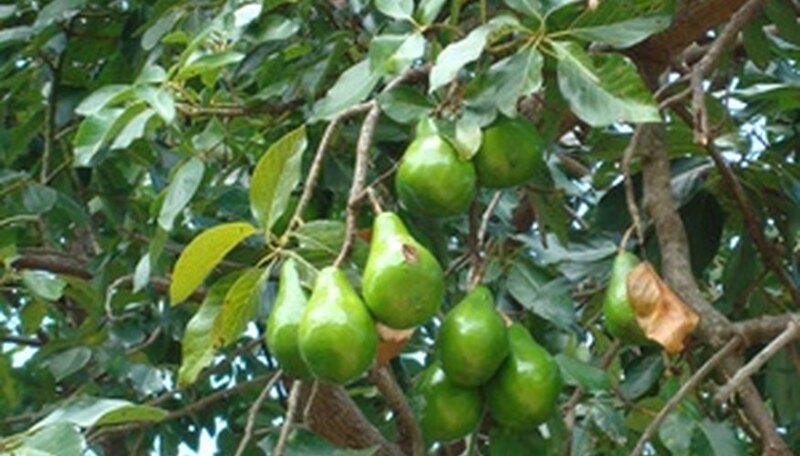 Fertilize the avocado tree with a granulated fertilizer mix such as 10-10-10 or 12-12-12. In California, the fertilizer needs to contain an additive of zinc. Apply 1 to 2 teaspoons once a year in the spring. Soak the avocado tree when watering and then allow to dry out completely. When the temperatures in California are extreme, the tree requires daily watering. In the winter, the trees will normally require watering only once every two weeks. Plant in full sunlight. The avocado tree will grow in shade but it will only produce fruit in full sunlight. Avoid planting beside others plants, shrubs or trees because the vigorous growth habits of the avocado tree will easily take over the area and rob the other plants of nutrients. Avoid planting in areas where concrete is present because the root system of the avocado tree often rises above the ground and will crack or heave the concrete.